I was originally going to recreate the picture she had on her blog, but I didn't have enough of the right colors, so my color selection was based solely on which colors I had enough of! I used Kona Ash for the background and the rest is a mix of Kona (the yellows), Bella (aquas), and Free Spirit (coral) solids. 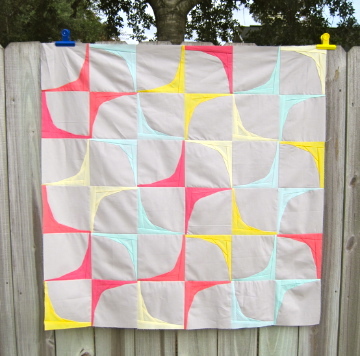 I will say that Free Spirit is my favorite line for solids--much softer feel and more saturated colors. sub-cut each of the 6 colors into (4) 2.25"xWOF strips. This little charm is going to Ali as part of my "thank you" for helping me sooooooooo much! You're the best girl! Oh, just so you guys believe me when I say the pattern is coming, I'll give you a little sneak peak of the graphics Ali created for me! Crossing my fingers that the next time I blog I'll have everything ready to share!!!! I love that pattern! And I can't wait for LOVE! Your mini is great! And love your letters! Really cool pattern! I'm looking forward to your letters too! 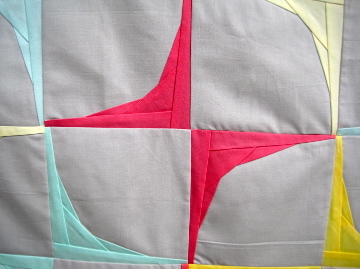 im so mathmatically challenged, but this quilt looks cool kelly. you are so efficient with your sewing...that must be it cause i can't finish a darn thing in one day!!! looking forward to your pattern! love that pattern. 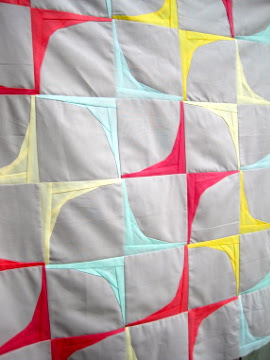 it is so different than the typical quilt and there is something about it that is so appealing to me. so excited for your pattern! SOOO excited! Great pattern Ali! You know I love and appreciate all things mathematical! 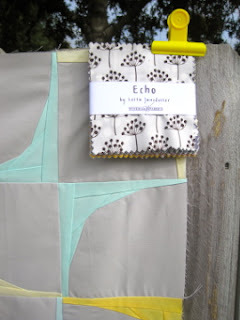 The quilt top is stunning and I'm really liking the Echo prints. 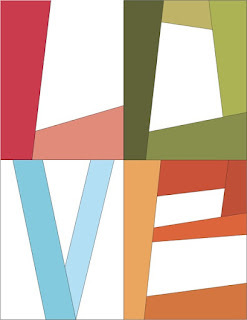 But I really can't wait for the Love pattern and the rest of the alphabet. I saw this last night on Ali's blog and loved it, I think you both got a great trade! The pattern and th colors are fabulous. Nice job!